Woke up this morning to find the international Edublog award shortlist. As you can see by clicking here, 21k12 has been shortlisted for Best School Admin Blog. I believe, after a quick review, that my blog is the only NAIS representative in this category. Readers are invited to click over to the voting and enter your choice! 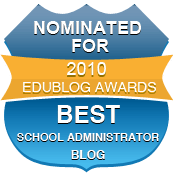 It is also great to see the six nominations for Connected Principals: one in Best School Admin Blog (which means I am “competing” against myself!) and others in Best Group Blog, Best New Blog, and three others. I am very excited and energized by my participation in Connected Principals. I am one of about 30 principals contributing to CP, and the dynamic among the group of us is wonderfully supportive and illuminating. I feel very good about what I have been able to contribute to CP, and I am pleased to have been able to raise my profile as a blogger by my contributions. You can vote for Connected Principals as Best Group blog here. My thanks to everyone for their support and encouragement; the positive feedback of my readers is highly motivating. Jonathan congrats on the recognition and thanks for sharing so much with your colleagues! Jonathan, well deserved! My math department chair came up to me today to ask if I had read your post on the ISM article. I love that we’re talking about people like you!